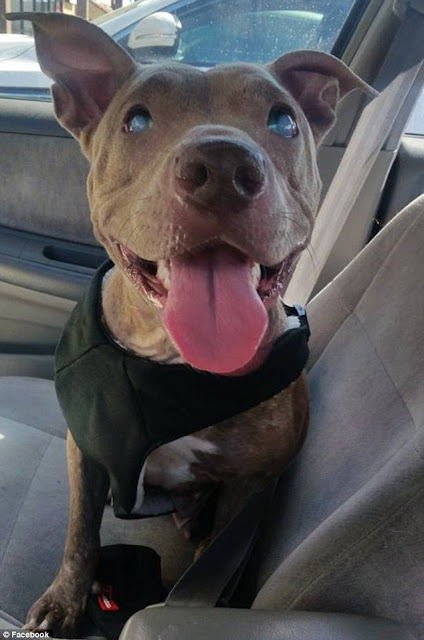 A blind pit bull who was abandoned on a park bench has been rescued and is 'thriving' says her rescuer. She was found by an animal control officer who brought her to the city pound. Her situation seemed dire until fate stepped in and she came to the attention of a woman who was scrolling through her Facebook feed. 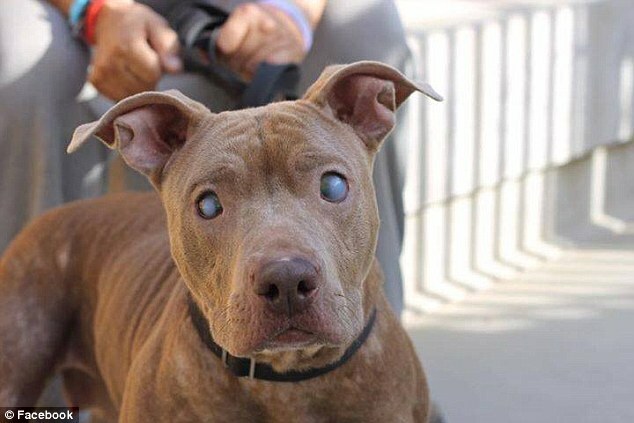 The kind-hearted woman, Jennifer Wales, who runs her own rescue out of Los Angeles and has been saving homeless animals for 25 years, couldn't resist the blind pooch's sad face. Pictures of her dressed up in a pink tutu and a bright yellow duck costume prove she's pretty fashionable as well. Happiness shines through her cloudy eyes. 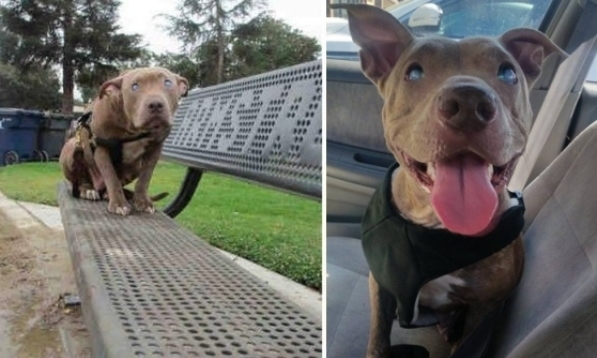 Responses to "Blind and terrified dog abandoned on a park bench saved by Facebook post"
Blessings to you :) for you kindness and compassion for saving this little one. I am so glad this story has a happy ending. 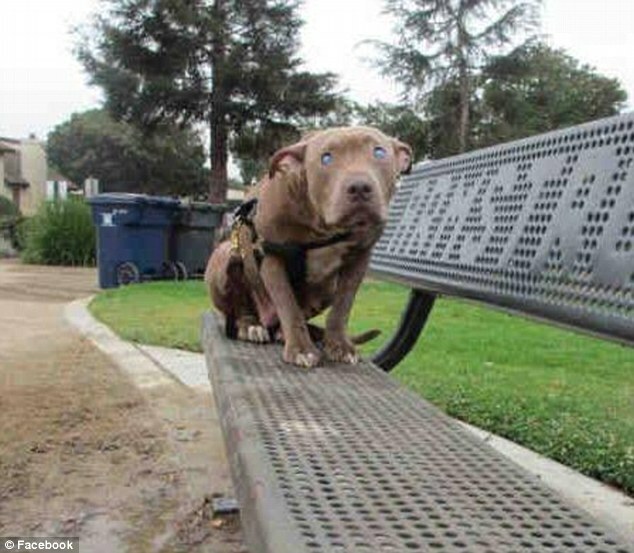 I cannot imagine how terrified she must have been being dumped on a park bench, not knowing where she was, afraid to move an inch. She could have been dumped on the edge of a cliff for all she knew! Thanks to all who helped save her and have given her a loving home! Adorable! She is beautiful! Glad she has a home that really cares!!! Thank God someone found her and has given her a chance in life. She is such a beautiful girl and deserves a wonderful home to care for her , I'm glad that someone has had the heart and loyalty to make this lovely girl a home were she feels safe loved and apart of a family were her soul will shine. Let's hope this thing dose not happen again by making people aware of incidents such as this but also the shame they should feel on there actions . Poor baby. She needs a halo so she doesn't bump her head. You can get one from muffinshalo.com or halosforpaws.com. Looks like she was bred, puppies were not as good as they should be , so they got rid of her. Nothing new there.